Doctors have recommended you have radioiodine (also called radioactive iodine) to treat your thyroid cancer. This is done at Christchurch Hospital's Nuclear Medicine Department. This page explains how radioiodine works, side effects and any precautions you need to take. After surgery for thyroid cancer, there's usually some thyroid tissue left that the surgeon couldn't remove. We must destroy this before we can treat you for any thyroid cancer that may have spread to lymph glands in your neck. Once all your thyroid tissue has been removed, we can keep an eye on your thyroglobulin blood level, which can help to show if the cancer returns. Radioiodine destroys your thyroid cells. It's usually given as a capsule. Some people need to take it again in six to 12 months. No. It has been used since the 1940s and is now an essential part of treating thyroid cancer. Not really. The iodine has no taste. Sometimes people feel a bit sick (nausea), and sometimes they have a sore throat for up to a week after treatment. Occasionally they develop a dry mouth because they make less saliva after radioiodine treatment. This is usually a temporary problem. Will I need thyroid hormone replacement after treatment? Yes. You'll need to take thyroxine for the rest of your life. Sometimes you'll be given a slightly higher dose of thyroxine, which can help to stop your body's attempts to regrow any thyroid cells. This is called suppressive thyroxine therapy. How much radioiodine will I have? Your doctor will decide how much radioiodine you need. It will depend on how much of your thyroid gland is left after surgery and the type of cancer you have. No, not with the dose you'll get. Radioiodine is one of the safest treatments available. When people need larger doses, radioiodine can slightly increase their risk of developing a different cancer. But this is only a 1% increase in risk for doses of radioiodine around six times more than you'll get for outpatient treatment. Careful study shows there's no risk to babies if we're careful. No pregnant woman should have radioiodine. Premenopausal women should practise safe contraception for one month before treatment. Women routinely have a pregnancy test before they're treated. No breastfeeding women should have radioiodine. Women should stop breastfeeding two months before radioiodine, to make sure the radioactivity doesn't affect their breast tissue. We normally advise men to avoid fathering a child and women to avoid pregnancy for six months after treatment. Iodine treatment doesn't affect fertility. Will the radioiodine affect my children? There's no evidence that children are affected by their parent's treatment. But we still recommend that you reduce your children's radiation exposure to a minimum. The doctor who prescribes the radioiodine will tell you how long after the radioiodine your thyroid will be radioactive. During this time, usually seven to 10 days, you shouldn't have children closer than two arms' length for more than a few minutes at a time. But you don't need to stop essential contact such as cuddles, dressing or soothing. It's best to avoid kisses for 48 hours after the radioiodine. For about one week after the treatment, it's best that you sleep in a separate bed from your partner. Your doctor will talk to you about this. Should I stay off work after the treatment? This really depends on your job. If you work with children or pregnant women, you should take some time off work. If you work with adults, keeping them at two arms' length from you for a few days may be all you need to do. The doctor will talk about this with you. It's best that you go home by car. If you do have to take public transport, make sure that you only sit with adults. Move to another seat if a child or pregnant woman sits down within two arms' length. Does all the radioiodine go to my thyroid? Your thyroid takes up much of the radioiodine and you remove the rest through your urine and bowel movements (poo). During the first three days after the radioiodine, flush the toilet immediately. Then flush the toilet a second time and wipe up any spilled urine with a tissue and flush it away. Always wash your hands well afterwards. It's best for men to use the toilet sitting down. There will also be radioactivity in other body fluids, including mucus from your nose, saliva, and sweat. Use tissues to wipe your nose and make sure you put them in the rubbish – preferably not in your living areas. Don't leave tissues lying around. Avoid cooking food for others and use your own crockery and cutlery for several days after your treatment. If you have any more questions, please ask your doctor. Written by the Department of Endocrinology, Christchurch Hospital. Adapted by HealthInfo clinical advisers. Last reviewed April 2018. Images courtesy of FreeDigitalPhotos.Net. 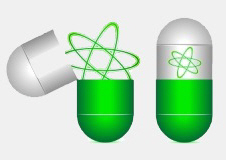 Radioactive capsule by digital art, family by Ambro.